UNITED NATIONS, April 22, updated -- The UN's supposedly "external" Board of Inquiry into the murder of Louis Maxwell and other UN staff in Kabul last October was revealed Thursday to have been under the decidedly "internal" leadership of Andrew Hughes, who served as the UN's Police chief from 2007 until, it seems, March 8, 2010. The Board of Inquiry began, without any public notice, in January 2010. The Board of Inquiry was triggered by cell phone video footage showing Louis Maxwell, long after fighting around the guesthouse was over, being shot and killed, and not by Taliban. The UN knew this since December, but only belatedly and begrudgingly discussed the issue publicly when asked, repeatedly, in April. At the noon briefing of April 20 in response to Inner City Press' questions, UN Spokesman Martin Nesirky stated "this particular board... was composed of external and internal senior personnel with relevant backgrounds and Afghanistan expertise -- including in security; investigations; and agencies, funds and programmes. It was led by a former senior Australian Federal Police Officer." While Nesirky emphasized "former Australian Federal Police Officer" -- that is, external to the UN -- since then, Mr. Hughes was named to a UN post by Secretary General Ban Ki-moon. In fact, during his service with UN Police, the unit's publication "UN Police Magazine of July 2009"described the unit's work in Afghanistan as "forging trust in uniformed police, establishing faith in national justice systems." One wonders: isn't a bit of a conflict of interest to have Mr Hughes be responsible for evaluating the actions of the Afghanistan National Police, an entity that Mr Hughes was responsible "forging trust" and "establishing faith" in? On April 22, Inner City Press asked UN Spokesman Nesirky basic factual questions about the overlap of Mr. Hughes service as UN Police chief and as "external" leader of the Board of Inquiry, and whether once he left his Police chief post, he was paid by the UN for this "external" work. Nesirky refused to answer these or other questions, saying that all he would say was a prepared statement that the Board of Inquiry -- disclosed belatedly and only after questions -- was now complete but that Afghanistan and "other relevant stakeholders" must have time to respond before the UN speaks about it. Video here, from Minute 44:26. Will the UN identify the probe's other members? Were other UN departments informed of the composition of the board prior to its commencement of work, and invited to participate, or was the Board just selected and appointed by DPKO/DFS? 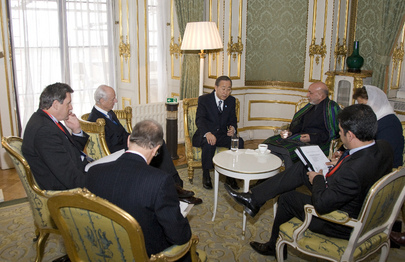 Can the UN confirm Ban Ki Moon's prior statement that Afghan police failed to respond to the guesthouse for 90 minutes? Was Louis Maxwell's weapon retrieved by the UN, and does the UN have it in its possession? Was the killer of Louis Maxwell ever identified or apprehended? Where is he now? Thursday at the UN noon briefing, Inner City Press asked "where is Mr. Banbury today," since he did not respond to these written questions about his on the record claims. Neskiry would not answer. In fact, in what a number of reporters viewed as retaliation, Nesirky tried to deny Inner City Press to right to ask any other questions, cutting off any follow up and saying "one more question," about a movie. As Inner City Press put forward a question, Nesirky closed his binder and stood. Video here, from Minute 59:25. The question was about Thailand and requests made to the UN by the protesters. Nesirky relented and read out another statement, dodged a question on Sri Lanka and was gone. And so it goes at the UN. Footnote: Inner City Press does not like to disparage other media, particularly one which like the writer of Turtle Bay has done good work at and on the UN, on OIOS and many other topics. While Turtle Bay says it was offered the Banbury briefing and had no choice but to take it, it is noteworthy that Banbury and UN thought this "blog" was the best venue to unilaterally put out their side of the story. We put "blog" in quotes, including to follow UN Spokesman Martin Nesirky's statements April 21 against what Inner City Press "put on [its] blog" about the UN covering up. Is this 2010, the UN, using one blog against another? One might for example note in blog-style that Banbury is most famous of late for saying that news of three rapes in camps in Haiti "almost elated me," and then issuing a convoluted clarification later. Now he speaks unilaterally and takes no questions. "Like Tiger Woods' first press conference," as one reporter put it. Watch this site. UNITED NATIONS, April 21 -- With questions mounting about whether and why the Afghan National forces killed UN security officer Louis Maxwell in Afghanistan last October, and why the UN said nothing publicly about this until being repeatedly asked about it last week, things heated up Wednesday at the UN in New York. After in Kabul Secretary General Ban Ki-moon's representative Staffan de Mistura dodged Afghan television questions about Maxwell's death, Ban's spokesman Martin Nesirky, lashed out at Inner City Press' use in a "blog" of the word "cover up" This is how UN staff in Kabul who raised the issue to Inner City Press characterize the UN's response. "people died in the guesthouse about forty yards from my door. One of those people was an American by the name of Louis Maxwell, a security guard for the United Nations...Louis Maxwell committed himself effectively and honorably and survived the Taliban attack. It was only after he came down from the roof, and after the ANP had secured the compound, that he was killed. According to video obtained by the UN, he was shot at point-blank range by Afghan police in the courtyard of the guesthouse. The reason? They wanted his gun." Inner City Press asked Nesirky to state, yes or no, if the UN has Maxwell's gun in its possession. Rather than answer this question, Nesirky went into a seemingly prepared statement that, "let's be clear, you have written that' management of information is one thing, cover up and lies are another'... that is outrageous." When Inner City Press explained that cover up and lies precisely the characterizations used by the UN staff in Kabul who have raised this to Inner City Press, Nesirky chided Inner City Press for not then putting the words in quotes and presumably identifying the speaker. But the UN has a history of retaliating against whistleblowers, so it is perhaps this request -- and misuse of the bully pulpit of the UN's briefing room rostrum -- which some find outrageous. Once the UN became aware -- and more, with the video footage -- that Maxwell may have been executed by Afghan National forces, why did it say nothing publicly? Nesirky did not answer. If this "Board of Inquiry," Ban Ki-moon's awareness of which his spokesman Nesirky would not describe, were to conclude that there is no definitive evidence Maxwell was killed by a particular member of the Afghan National forces, would the UN ever have disclosed the doubts and inquiry? 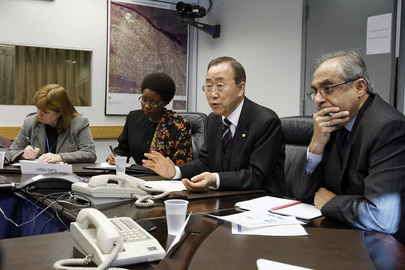 I wish to bring to your attention the disgraceful lack of action by the UN Secretary General in response to aspects of the tragic attack upon the Bakhtar Guesthouse in Kabul, Afghanistan on 28 October 2009 which resulted in the deaths of five UN staff members and injuries to many others. I am referring to the following facts which came to light during the investigation. * Three of the other staff members killed during the incident were actually shot by indiscriminate and undisciplined fire from the Afghan security forces. The only staff member to actually die from the attackers actions was the UNICEF staff member who burned to death. SG Ban needs media pressure to explain his failure to follow up on this crime with the Government of Afghanistan to ensure that those responsible are held accountable for their actions. Again, once the UN became aware -- and more, with the video footage -- that Maxwell may have been executed by Afghan National forces, why did it say nothing publicly? 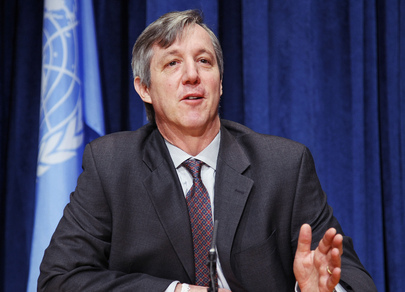 Does the UN have in its possession Louis Maxwell's weapon? Watch this site. Question: I wanted first to… I have a question about Sudan from yesterday, but I wanted to follow up on this Afghanistan Board of Inquiry questions. One is that a witness to the events has come forward and said that Mr. Maxwell was killed for his gun, that the Afghan national forces wanted his high-end assault rifle, and therefore killed him to take it. They say it’s a… the gun is a Heckler and Koch g36k assault rifle. What I wanted to know is, even as this is going on, does the UN have in its possession at the end of those events the weapon used by Louis Maxwell in defending the other staff members? And also, is the Secretary-General, I think I’d asked this in a written question I sent to you, before Ms. [Susana] Malcorra convened this Board of Inquiry, was the Secretary-General aware of this issue and did he approve of the composition and mandate of the Board of Inquiry? Spokesperson: It may be a factual question, Matthew, and let us be really clear about one thing, I seem to recall that you have written somewhere that management of information is one thing, but cover up and lies are another. Well, let me say here and now that this is pretty outrageous and also insulting. We’re talking about the death of one of our staff, a UN security officer who helped to save many lives. It’s our responsibility, it’s our duty to find out the facts. That is exactly what we are doing. And this is a Board of Inquiry; everything is being done as it should. And once this has been finalized and given to those who need to know first, there will be a briefing, I am sure, as I have said, this has been done in the past. And there will be an opportunity for you to ask further questions. Spokesperson: No, it’s outrageous what you wrote. It was not a quote, it was not a quote. It’s what you wrote in your blog. Spokesperson: And it was not a quote from someone. Question: I didn’t know that this was a forum for you to critique articles, but I just wanted to know [inaudible]. Spokesperson: No, it is, because it is possible for me to respond to you in the same way that it is possible for you to respond to me. What I am trying to tell you is that -- let me finish. The UN lost a number of people, including the security officer, Mr. Maxwell, who had saved many lives. We want to know what happened. We’re looking into this. We want to know what happened. There is a Board of Inquiry that has looked into this and it is finalizing its report. That’s the most important thing that we’re trying to find out. We want to know. You want to know, we want to know. And when the Board of Inquiry has finalized its report, then those who need to know first of all, would be told. Question: When was the UN going to say publicly that they were aware of an alternative theory of the death of Louis Maxwell and three other staff members? Spokesperson: There is a Board of Inquiry that has been working on this for a long time. You’ve seen the timeline. Question: But you’ve also said that if only in cases where, depending on the finding, it may or may not be made public. If this inquiry were done, and I think this was the sense of staff in Kabul, if the inquiry were done and the UN decided to conclude that there wasn’t conclusive evidence that Louis Maxwell was killed by Afghan national forces, would the UN have ever said anything publicly about this? Spokesperson: There is no need for the United Nations to -- let’s put it this way, the United Nations wants to know. Colleagues want to know. Friends want to know. Family want to know. We want to know. He was our guy. We want to know what happened. And the Board of Inquiry is doing, and has been doing, the job that it was asked to do, which is to find out. There is a due process here that is being followed. Question: Due process for who? For the Afghan national, unnamed Afghan national forces, that’s what I know; I mean due process usually means the accused. Spokesperson: It means following the procedure for, with -- as I have said to you -- standard operational procedure for these kinds of boards within the United Nations. And I have said here before, that if warranted, this will be taken up with the Afghan authorities -- the findings. Question: Okay. I know, I understand. Just to be clear, I just want your quote. To those who feel that the lack of any public statement by the UN from -- since October -- about this issue despite their knowledge amounts to a cover up, what would you say? Spokesperson: Absolutely not the case. Absolutely not the case. This is a Board of Inquiry that was set up to look into what was obviously an extremely tragic event, and to ensure that, to the extent possible, we find out what happened. My point was to you Matthew, very specifically, about one line in your blog that was not a quote from people, it was something that was just written there. Question: [inaudible] I don’t quote them because they’re speaking off… they believe that the UN would retaliate against them. I mean, that’s… maybe you are unaware of those concerns. I wanted to ask about Sudan, because I think we may have exhausted this, at least for today.